The Sandia Mountains (Southern Tiwa: Posu gai hoo-oo, Navajo: Dził Nááyisí; Zuni: Chibiya Yalanne) are a mountain range located in Bernalillo and Sandoval counties, immediately to the east of the city of Albuquerque in New Mexico in the southwestern United States. The range is largely within the Cibola National Forest, and part of the range is protected as the Sandia Mountain Wilderness. Its highest point is Sandia Crest, 10,678 feet (3,255 m). Sandía means watermelon in Spanish, and is popularly believed to be a reference to the reddish color of the mountains at sunset. Also, when viewed from the west, the profile of the mountains is a long ridge, with a thin zone of green conifers near the top, suggesting the "rind" of the watermelon. However, as Robert Julyan notes, "the most likely explanation is the one believed by the Sandia Indians: the Spaniards, when they encountered the Pueblo in 1540, called it Sandia, because they thought the squash gourds growing there were watermelons, and the name Sandia soon was transferred to the mountains east of the pueblo." In Southern Tiwa, Posu gai hoo-oo means where water slides down arroyo. The author also notes that the Sandia Pueblo Indians, who are Tiwa speakers, sometimes call the mountain Bien Mur, "big mountain". The Sandias are a small range, a part of the Basin and Range Province, but built by a different phenomenon, consisting of a single north-south ridge, which rises to two major summits: Sandia Crest and South Sandia Peak, 9,702 ft (2,957 m). The range measures approximately 17 miles (26 km) north-south, and the width in the east-west direction varies from 4 to 8 miles (6 to 12 km). The west side of the range is steep and rugged, with a number of sheer rock walls and towers near Sandia Crest. The east side has a gentler slope. The Sandias are part of a single larger geologic unit, the Sandia–Manzano Mountains. The other part consists of the Manzano Mountains which lie to the south of the Sandias. The two ranges are separated by Tijeras Canyon, which leads to a historically important pass; the canyon is traversed by Interstate 40, following the route of historic U.S. Route 66. The Sandias are the highest range in the immediate vicinity, and are well-separated from the higher Sangre de Cristo Mountains. This gives Sandia Crest a relatively high topographic prominence of 4,098 ft (1,249 m). Lying to the east and northeast of the Sandias are two smaller ranges, the Ortiz Mountains and the San Pedro Mountains. The Sandia Mountains are home to the world's second longest tramway, Sandia Peak Tramway, which is 2.7 miles (4.3 km) long. Over this distance the tram cars ascend over 4,000 feet (1,200 m). The average speed of the tram car is 12 mph (19 km/h), and the length of the ride is approximately 15 minutes. The current longest tramway as of 2010 is in Armenia. The Sandia Mountains are a fault block range, on the eastern edge of the Rio Grande Rift Valley. The Sandias were uplifted in the last ten million years as part of the formation of the Rio Grande Rift. They form the eastern boundary of the Albuquerque Basin. The core of the range consists of Sandia granite, approximately 1.5 billion years old (there is also some metamorphic rock of age 1.7 billion years). This is topped by a relatively thin layer (approximately 300 feet/100 meters) of sedimentary rock (mostly limestone, and some sandstone) of Pennsylvanian age (circa 300 million years ago). The limestone contains marine fossils including crinoids, brachiopods, gastropods, horn corals, and bryozoans. However, most of the fossils are too small for the human eye to detect. Potassium-feldspar (K-spar) crystals embedded within the Sandia granite give the mountains their distinct pink color. There are two easy ways to reach the top of the Sandias. The Sandia Peak Tramway ascends from the west side to a point on the crestline about 1.5 miles (2.4 km) south of Sandia Crest, at the top of the Sandia Peak Ski Area, which is located on the east side of the mountains. A road (NM 536) from the east provides access to the bottom of the ski area and also to the Sandia Crest itself, where there is a gift shop, restaurant, scenic overlook, and a large electronic communication site with numerous towers and antennas. The Sandia Crest Scenic Byway is also a popular path for motorcycle riders with its miles of winding road to the summit. The Sandia Mountains are the most visited range in New Mexico. Numerous hiking trails exist on both sides of the range, such as the popular La Luz Trail and Crest Trail. Much of the west side of the range is included in the Sandia Mountain Wilderness; the trails on that side are steeper, and water is very scarce. Numerous picnic and recreation sites can be found on NM 536. These sites, along with some sites on the west face of the Sandias, require a $3 daily use/parking permit as part of the National Fee Program. There are no developed campgrounds in the Sandias. The rock walls and pinnacles on the west side of the range provide abundant rock climbing opportunities, from bouldering and top-roping to multi-day big wall climbs on the Shield, the largest rock feature on the mountain. However the long hikes (often off-trail) required to reach many of the climbs, and the variable quality of rock (often poor), prevent the Sandias from being a major climbing destination. Both Sandia Peak and Sandia Crest are popular launching sites for recreational hang gliding due to the sheer drop-offs to the west. Launches at the Peak occur throughout the summer. The Sandias contain a location notable for prehistoric archaeology: the Sandia Cave was believed by some in the 1930s to the 1950s to have been inhabited 10000 to 12000 years ago by the "Sandia Man," a cultural classification that is no longer used. The cave can be accessed via a 1/2 mile trail in Las Huertas Canyon, on the northeast side of the range, near Placitas, New Mexico. Ancestral and early Pueblo peoples have lived in the Sandia Mountains area for thousands of years. Examples of previous Pueblo settlements, now unoccupied, include Tijeras Pueblo and Pa'ako Pueblo, both founded around 700 years ago. 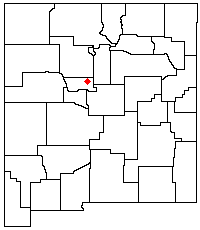 Sandia Pueblo is a modern pueblo, abutting the Sandia Mountains on the northwest side of the range. Some of the foothills of the range are on Sandia Pueblo land; there have been disputes in the past between the Pueblo, the Forest Service, and private landowners over rights to various parts of the range. The people of Sandia Pueblo consider the mountains a sacred place. ^ "sandía - Diccionario Inglés-Español WordReference.com". www.wordreference.com. Retrieved 15 April 2018. ^ Julyan, Robert, The Place Names of New Mexico, (revised edition), Albuquerque, NM: UNM Press, 1998. ^ Robert Hixson Julyan; Mary Stuever (2005). Field Guide to the Sandia Mountains. UNM Press. p. 127. ISBN 978-0-8263-3667-5. ^ "World's longest aerial tramway opened in Armenia". RIA Novosti. 16 October 2010. Retrieved 28 December 2017. Previously, a 4-kilometer-long (2.48-mile-long) Sandia Peak Tramway in the United States' Santa Fe was the longest in the world. ^ "Western US Climate Data". Retrieved 2013-02-26. ^ 1943-, Julyan, Robert,; Mary., Stuever, (2005-01-01). Field guide to the Sandia Mountains. University of New Mexico Press. ISBN 9780826336675. OCLC 56982334. ^ Richard Backus (January–February 2008). "Sandia Crest, New Mexico". Motorcycle Classics. Retrieved 2009-08-10. ^ "Albuquerque, NM: Sandia Crest Trail (South)". backpacker.com. Retrieved 15 April 2018. ^ Hibben, Frank C., Association of Man with Pleistocene Mammals in the Sandia Mountains, New Mexico, American Antiquity, 2(4):pp. 260-263, 1937. ^ “the continual inconsistencies in the literature gave rise to the general view that all data from Sandia Cave were unreliable” p. 342, Thompson, Jessica C., Nawa Sugiyama and Gary S. Morgan, Taphonomic Analysis of the Mammalian Fauna from Sandia Cave, New Mexico, and the Sandia Man Controversy, American Antiquity, 73(2):pp. 337-360, 2008. Chronic, Halka, Roadside Geology of New Mexico, Mountain Press Publishing, 1987. Julyan, Robert and Mary Stuever, eds., Field Guide to the Sandia Mountains, Albuquerque, NM: UNM Press, 2005. Schein, Mick, Sandia Rock, Boulder, Colorado: Sharp End Press, 2003. Hibben, Frank C., Association of Man with Pleistocene Mammals in the Sandia Mountains, New Mexico, American Antiquity, 2(4):pp. 260–263, 1937. Thompson, Jessica C., Nawa Sugiyama and Gary S. Morgan, Taphonomic Analysis of the Mammalian Fauna from Sandia Cave, New Mexico, and the Sandia Man Controversy, American Antiquity, 73(2):pp. 337–360, 2008. Wikimedia Commons has media related to Sandia Mountains. This page was last edited on 9 December 2018, at 03:47 (UTC).